Saying It Another Way: How Can I Use It? 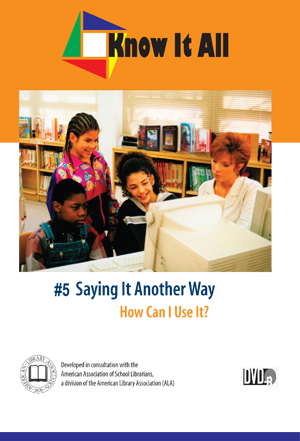 Home > • Language Arts > Know It All > Saying It Another Way: How Can I Use It? When Bunker and his buddy, Jim, find out that their favorite bike trail has been closed to make way for a shopping mall, Bunker decides he must find a way to persuade the city to reconsider the move. In the process he learns that saying what is important—in his own words—is the best way to be heard. Your students gain practice in rephrasing information, and an understanding of the importance of using their own words.